The typical modern production boat owes much to the demands of the charter market, and few builders are tied as deeply to that market as Beneteau, whose Oceanis and Cyclades lines have been mainstays of The Moorings’s fleets (among others) for close on two decades. Comfort and reliability come before speed in the charter operator’s wish list, but in recent years the emphasis has shifted towards boats with more satisfying sailing performance. 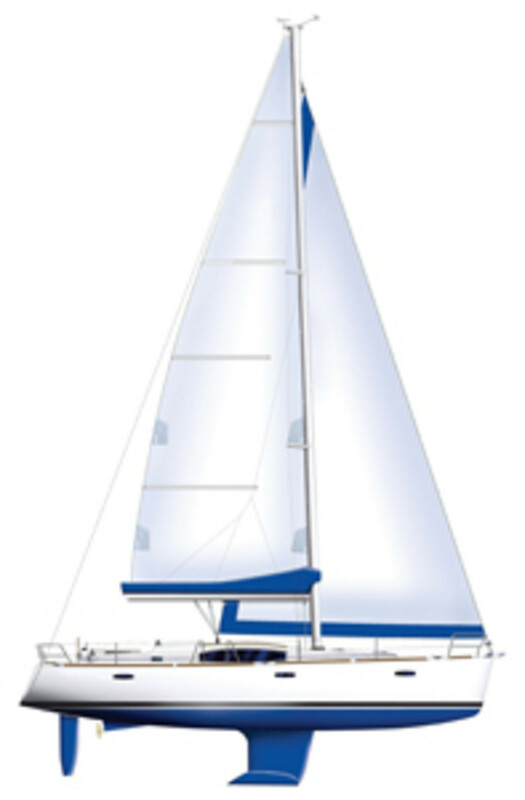 One such is the Beneteau 43, which I sailed in Tortola recently in its guise as the Moorings 43.4, the four-cabin version of the Oceanis 43 “family.” You can also order the boat with just two large cabins with generous ensuite head compartments, or in a three cabin/three head layout. The four-cabin/two head version seems to be the hot ticket for charter fleets, though, at least for value-conscious charterers. You could squeeze ten people onto this boat, not that you’d necessarily want to. Jamming four cabins into a 43* hull while retaining enough saloon, galley, and stowage space to make the boat a viable vacation platform can’t have been easy, but the collaboration of Berret/Racoupeau (hull) and Nauta Design (interior) has done it nicely. Forward of the main bulkhead, the spacious stateroom and heads of the two- and three-cabin versions are replaced with a smaller V-berth and a two-bunk cabin that would be ideal for a couple of children. All of these cabins are on the snug side but are perfectly habitable. The communal living areas are unaffected by this design finesse, and the saloon in particular is roomy and inviting. 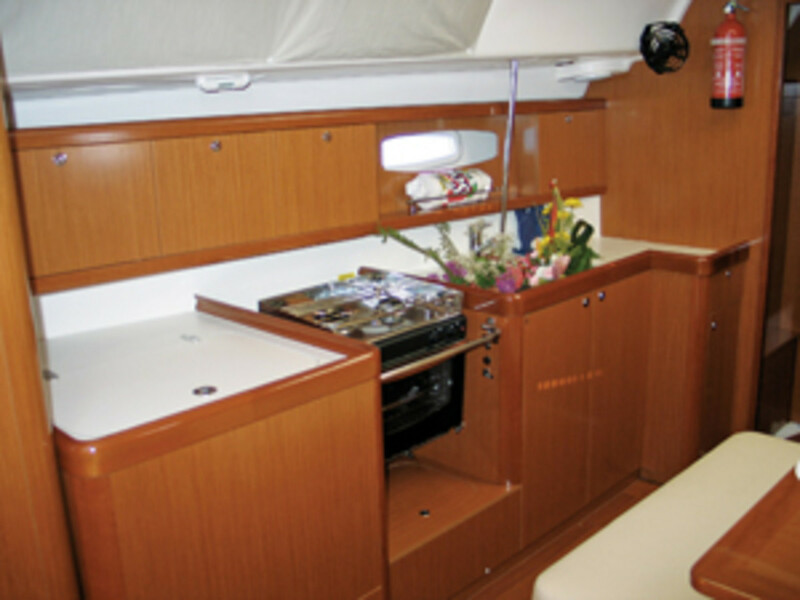 The linear galley would not be my choice for seagoing duty but it’s ideal for chartering, where you’ll seldom be cooking belowdeck, and for coastal cruising, where you’ll seldom be cooking while under way. Stowage was plenty adequate for a week or more exploring out of supermarket range. I found the headroom generous; doorways were well sized and there was reasonable space for showering in both head compartments. Most Beneteaus sold on this side of the Atlantic are built in Marion, South Carolina, but the 43 family comes from France. Construction is the same either way: cast iron keels, fiberglass/balsa sandwich deck, solid fiberglass hull with an internal pan molding to stiffen the structure and soak up keel and rigging loads. The 19/20ths rig has a split, non-adjustable backstay and aft-raked spreaders that help provide both forestay tension and a narrow sheeting angle for the genoa. All lines are led aft to the cockpit. This is not a heavy boat for its length and the easily-driven hull has a long sailing waterline. With the sails sheeted in, the boat sailed itself to windward at over 6 knots in under 10 knots of true wind, and with the sheets cracked off a little the 43 nudged up to 7 knots. Twin wheels are all the rage now; not only do they ease access to the swim platform but they let the helmsman keep an eye on headsail luff and traffic from either quarter. The refinement that’s gone into these twin-wheel systems over the last few years was evident in the lightness of the steering. Standard draft is 5&apos;5" but there is a 6&apos;7" option for those who prefer the windward bite of a deeper keel. I like the styling of the new Oceanis range and this boat is quite an eye-catcher. The boat I sailed was rigged up Caribbean-fashion with a bimini that covered the entire cockpit; this somewhat diminished the visual appeal but would be one of the first options I’d check, whether I was putting the boat into charter or loading the family on board for a summer cruise. Price: Landed East Coast U.S.A.
U.S. 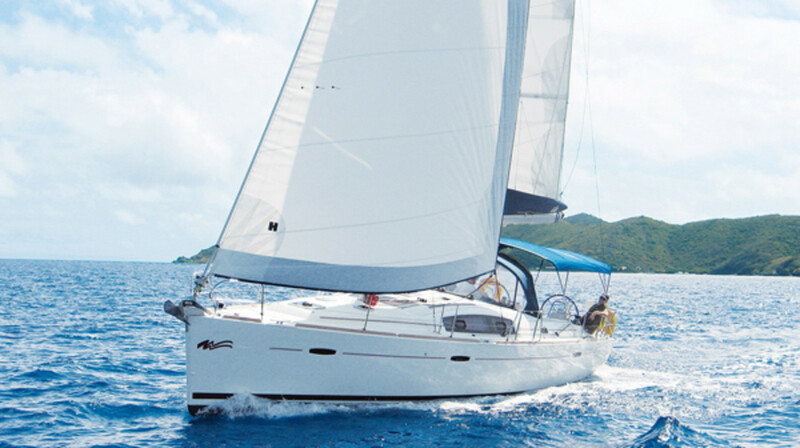 Distributor: Beneteau USA, Inc., Marion, South Carolina, 843-629-5300.